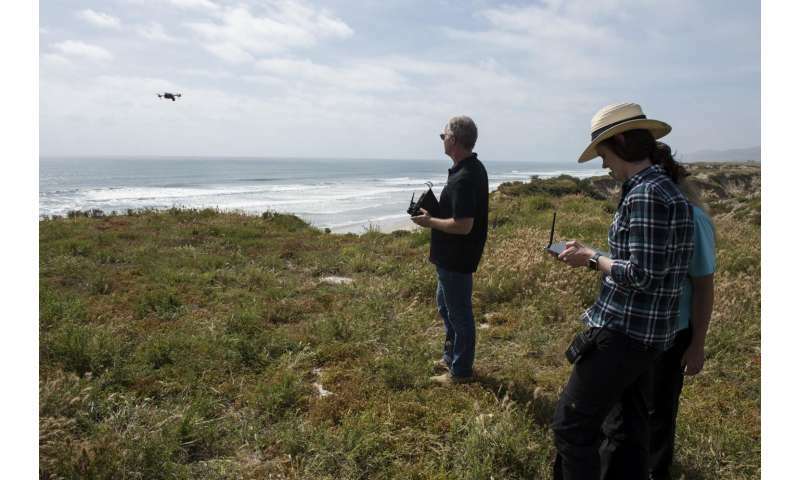 Oelrich, a scientist at Naval Surface Warfare Center (NSWC) Carderock's Combatant Craft Division, and Stephanson, president and chief executive officer of Broadband Discovery Systems (BDS), stared at an Android tablet showing search data from an unmanned aerial drone they had just flown. The device's screen glowed as a green fluorescent map appeared, splashed with red clusters of varying sizes and shapes. "See that large cluster?" asked Stephanson. "That's the dummy mine we buried. The smaller blotches near it are construction rebar we found nearby. The drone detected and localized these items quickly and accurately, which would be extremely valuable in a real combat scenario." Oelrich and Stephanson were testing the new Mine Warfare Rapid Assessment Capability (MIW RAC) system. Sponsored by the Office of Naval Research's (ONR) TechSolutions program, MIW RAC consists of a one-pound quadcopter outfitted with an ultra-sensitive magnetometer sensor system to detect mines and provide real-time search data to a handheld Android device. "This technology will help Sailors and Marines who are approaching a beachfront to rapidly clear, or at least determine the location of, mines or other hazards that are in their way," said ONR Command Master Chief Matt Matteson. "It could potentially save a lot of lives." MIW RAC is a portable, remote-controlled system that can detect buried or underwater mines during amphibious beach landings. It's designed to help explosive ordnance disposal teams quickly find mines and dangerous metal obstacles within coastal surf zones and very-shallow-water zones. MIW RAC would provide a new, real-time aerial complement to existing underwater mine-detection capabilities. "Everyone wants to know where they are going and what they are about to get into," said Oelrich, who is overseeing the development of MIW RAC. "It helps to have a rapid capability to just fly something in the air and survey an area before you put troops on the ground or bring a vessel ashore." MIW RAC originated in 2015, when the Navy Expeditionary Combat Command (NECC) sent a request to ONR's TechSolutions program for a portable system that could detect potential hazards in surf zones, be easy for warfighters to use and fit diverse platforms. TechSolutions is ONR's rapid-response science and technology program that develops prototype technologies to address problems voiced by Sailors and Marines, usually within 12-18 months. "We took our inspiration from a stationary scanning system developed by BDS," said Oelrich. "It was sensitive enough to not only detect weapons, but identify the hidden location of the object on a person and the angle in which it was oriented—a knife in a front pocket or gun turned sideways, for example. "We flipped that concept on its head," she continued. "Instead of a stationary system detecting moving objects, we have a moving system detecting relatively stationary objects." Later this year, TechSolutions will deliver prototype MIW RACs to NECC's Explosive Ordnance Disposal Group for further testing and evaluation. Oelrich and her team hope to see the system issued throughout the fleet next year. There is a great deal of prospecting for gold in Australia with metal detectors. This kind of thing should greatly reduce the time spent looking for thing to dig up and check.